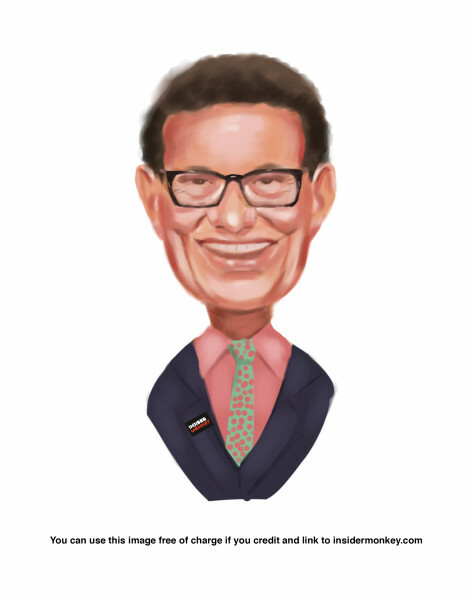 Did Hedge Funds Drop The Ball On Melco Resorts & Entertainment Limited (MLCO) ? The fourth quarter was a rough one for most investors, as fears of a rising interest rate environment in the U.S, a trade war with China, and a more or less stagnant Europe, weighed heavily on the minds of investors. Both the S&P 500 and Russell 2000 sank as a result, with the Russell 2000, which is composed of smaller companies, being hit especially hard. This was primarily due to hedge funds, which are big supporters of small-cap stocks, pulling some of their capital out of the volatile markets during this time. Let’s look at how this market volatility affected the sentiment of hedge funds towards Melco Resorts & Entertainment Limited (NASDAQ:MLCO), and what that likely means for the prospects of the company and its stock. Melco Resorts & Entertainment Limited (NASDAQ:MLCO) has experienced a decrease in hedge fund interest recently. 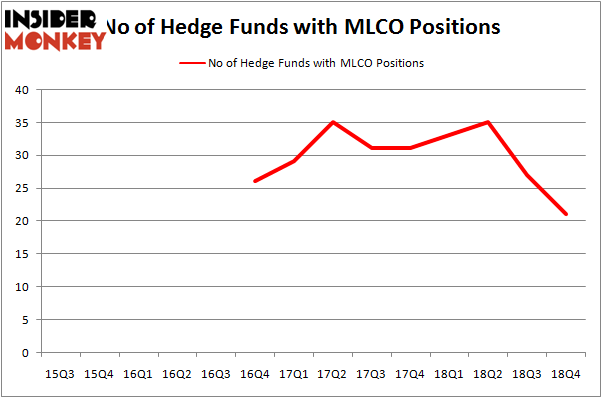 Our calculations also showed that MLCO isn’t among the 30 most popular stocks among hedge funds. In the 21st century investor’s toolkit there are dozens of metrics investors employ to evaluate publicly traded companies. Some of the most useful metrics are hedge fund and insider trading moves. Our researchers have shown that, historically, those who follow the best picks of the best investment managers can outclass the broader indices by a significant amount (see the details here). We’re going to take a glance at the latest hedge fund action regarding Melco Resorts & Entertainment Limited (NASDAQ:MLCO). What have hedge funds been doing with Melco Resorts & Entertainment Limited (NASDAQ:MLCO)? At Q4’s end, a total of 21 of the hedge funds tracked by Insider Monkey were bullish on this stock, a change of -22% from one quarter earlier. By comparison, 33 hedge funds held shares or bullish call options in MLCO a year ago. With hedgies’ capital changing hands, there exists a few notable hedge fund managers who were boosting their holdings significantly (or already accumulated large positions). Among these funds, Indus Capital held the most valuable stake in Melco Resorts & Entertainment Limited (NASDAQ:MLCO), which was worth $74.5 million at the end of the third quarter. On the second spot was Tremblant Capital which amassed $44.8 million worth of shares. Moreover, NWI Management, Renaissance Technologies, and Two Sigma Advisors were also bullish on Melco Resorts & Entertainment Limited (NASDAQ:MLCO), allocating a large percentage of their portfolios to this stock. Judging by the fact that Melco Resorts & Entertainment Limited (NASDAQ:MLCO) has faced bearish sentiment from hedge fund managers, logic holds that there is a sect of hedgies that elected to cut their entire stakes heading into Q3. At the top of the heap, Panayotis Takis Sparaggis’s Alkeon Capital Management cut the biggest investment of all the hedgies monitored by Insider Monkey, valued at an estimated $49.9 million in call options, and Alexander Mitchell’s Scopus Asset Management was right behind this move, as the fund dropped about $21.2 million worth. These transactions are intriguing to say the least, as total hedge fund interest was cut by 6 funds heading into Q3. Let’s check out hedge fund activity in other stocks similar to Melco Resorts & Entertainment Limited (NASDAQ:MLCO). We will take a look at Herbalife Nutrition Ltd. (NYSE:HLF), Centrais Elétricas Brasileiras S.A. – Eletrobras (NYSE:EBR), Zebra Technologies Corporation (NASDAQ:ZBRA), and Westlake Chemical Corporation (NYSE:WLK). This group of stocks’ market caps are similar to MLCO’s market cap. As you can see these stocks had an average of 21.75 hedge funds with bullish positions and the average amount invested in these stocks was $1273 million. That figure was $318 million in MLCO’s case. Herbalife Nutrition Ltd. (NYSE:HLF) is the most popular stock in this table. On the other hand Centrais Elétricas Brasileiras S.A. – Eletrobras (NYSE:EBR) is the least popular one with only 5 bullish hedge fund positions. Melco Resorts & Entertainment Limited (NASDAQ:MLCO) is not the least popular stock in this group but hedge fund interest is still below average. This is a slightly negative signal and we’d rather spend our time researching stocks that hedge funds are piling on. Our calculations showed that top 15 most popular stocks among hedge funds returned 21.3% through April 8th and outperformed the S&P 500 ETF (SPY) by more than 5 percentage points. Hedge funds were also right about betting on MLCO as the stock returned 44.6% and outperformed the market as well. You can see the entire list of these shrewd hedge funds here.